The Kona Kick Off is the first event in the Hawaii Marlin Tournament Series. A “Four Flags” tournament, the largest marlin earns 40% of the base purse, and the largest ahi, ono and mahi each earn 20% of the base purse. Patterned after the golf format, The Skins Marlin Derby is the most unique Big Marlin Tournament event of its kind. The Single Largest Marlin of the Tournament will be Winner Take All of the purse from the Base Entry division. There are TWO Winner Take All Categories to "Throw Down". The Hawaii Lure Makers Challenge began as the September Challenge in 2010 and has been redesigned with input from the top skippers. The minimum weight has been raised to 400 lbs and First Place Prize now pays 70% of the base purse. The event that started it all off in 1986. 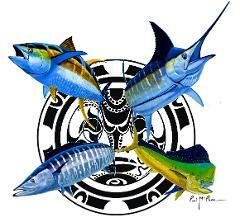 The BIMT was the very first high stakes, big game tournament in Hawaii to pay a cash purse for tag and release. "It's a Wrap" is a new tournament for September 2016 that will follow the HMT Series Points scoring system, so that all teams in the running can Wrap the season competing for all possible points.